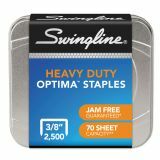 Swingline Optima High-Capacity Staples, 3/8" Leg, 2,500/Box - High-capacity staples deliver optimal stapling performance for convenient, everyday use. Stronger wire allows easier paper penetration and reduced jamming. Reusable metal box keeps the staples safe and secure while stored. Each strip includes 125 staples that are 1/2 in width with a 3/8" leg length. 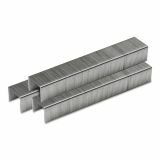 Staples are designed for use with Swingline Optima 60 and 70 sheet staplers (sold separately)."